Most states, cities and counties look forward to and announce their first babies of the New Year. Most of them are born in hospitals, but the first baby of the year in Banks County made his debut in such a way that few are likely to forget – especially the mother who gave birth to him. Eight months pregnant, the 37-year-old mother happened to be shopping inside the local Wal-Mart on New Year’s Day. It was during that shopping trip that her son decided it was time for his grand entrance into the world – one that he was apparently in a hurry to make. First responders raced to the store as quickly as they could, but they didn’t arrive quite fast enough for this baby. 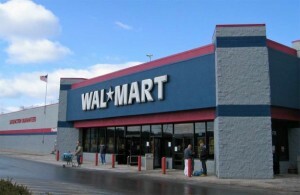 When they entered the Wal-Mart restroom, they found that the mother had already delivered the baby. Wal-Mart staff had already helped wrap the baby boy in his very first Wal-Mart blanket. EMTs said that the mother seemed healthy, but also a little worried. “Scared, mostly. It’s not exactly where somebody plans to have a baby,” Mack Palmer Banks Co. Paramedic told Fox Atlanta News. As for what fellow community members think about their first baby of the New Year…well, let’s just say they were a little surprised (but excited) to hear the news. “I believe this is not quite the place to have it, but at least she was safe. I guess they had a clean-up on aisle five,” Harlan Lovelace, a fellow community member, told Fox Atlanta News.